launched several new features and updates, including neural machine translation for more languages, and just a few weeks ago we enabled voice input for additional eight Indian languages. 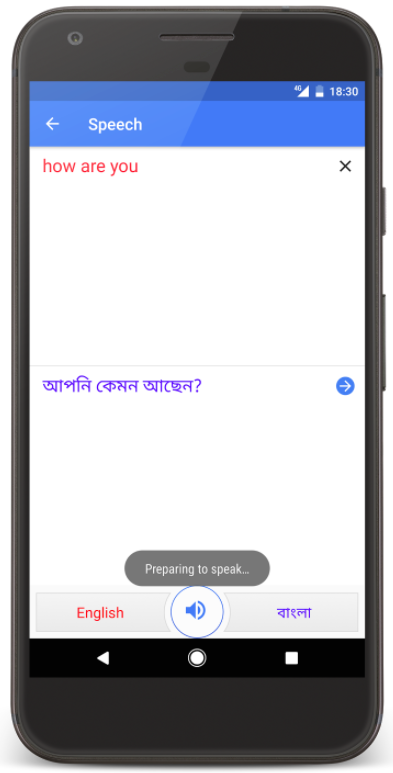 Today, we’re bringing several updates to the Google Translate app, making it easier for speakers of Bengali, Gujarati, Kannada, Marathi, Tamil, Telugu, and Urdu to translate when they’re on the go. Now, you can do offline translations and instant visual translation in seven more Indian languages, type a Translate query with your voice in eight more languages (the seven above and Malayalam), and use conversation mode in two more languages: Bengali and Tamil. All these features have been available in Hindi, and are now accessible for more languages on both Android and iOS*. With Google Translate, you can easily turn your phone into a powerful translation tool––for studies, business, or travel. But whether you’re on a spotty connection in a remote area or just want to switch off data while you’re on the go, sometimes you’d like to translate a word or sentence even when you’re not connected to the internet. This rings particularly true for us here in India, where connectivity can be an issue. To help you translate in moments like this, we’ve already enabled Offline Translation in Hindi, and now we’re launching the feature for seven more Indian languages––something many Indian users have asked about. If you’d like to do offline translations in say Kannada, you can download the Kannada language pack when you’re on WiFi. Then just open the Translate app, select Kannada on either side of the screen and then tap the download button. English is automatically embedded in all language packs, so you can start translating offline between English and your language straight away. With today’s update, we’re also launching instant visual translation for these seven Indian languages, so you can now translate signs or menus from English to Bengali, Gujarati, Kannada, Marathi, Tamil, Telugu, and Urdu, in addition to Hindi. The Translate app already lets you use camera mode to snap a photo of English text and get a translation for it in these languages. Now, we’re taking it to the next level and letting you instantly translate text using your camera—so it’s way easier for speakers of local Indian languages to understand English street signs in the city, or decide what to order from a restaurant menu. Word Lens is powered by machine learning, using computer vision to distinguish between letters on an image. To get started, open the Translate app, point your camera at an English sign or text, and you’ll see the translated text in your language overlaid on your screen. If you’re using Word Lens in a language for the first time, you might be prompted to download a translation file first, as Word Lens works offline. Conversation mode is a feature that lets you have a bilingual conversation with someone, simply by talking to the Google Translate app. For instance, when you’re at a marketplace trying to snag a good deal on that shawl, Conversation Mode can help you converse with the locals. This already works for Hindi, and today we’re launching two additional languages: Bengali and Tamil. Simply tap the mic to start speaking in a selected language, then tap the mic again, and the Google Translate app will automatically recognize which of the two languages are being spoken, letting you have a fluid conversation—it’s like having an interpreter in your pocket! Typing in Indian languages on a phone can be slow and cumbersome, in fact more people in India are using their voice to “type” a translation query than the keyboard. That’s why we’re excited to bring Voice Translation to more Indians––with the recent launch of voice input for eight additional languages, speakers of Hindi and now Bengali, Gujarati, Kannada, Malayalam, Marathi, Tamil, Telugu, Urdu, and Tamil can dictate their translation queries using their voice. For instance, if you’re on the go and would like to type with your voice in Urdu, open the Translate app, select Urdu on the left side of the screen, and tap the microphone to start talking. We’re hoping these new features help further bring down language barriers and provide more Indians with the ability to access information around them. All features announced today are already available in Hindi on the Google Translate app, and have started to roll out in the additional Indian languages both on Android and iOS*. With these updates, the Google Translate app supports Offline Translation for 59 languages, Word Lens for 37, Voice Translation for 66, and conversation mode for 40 languages. Our goal is to bring these and other features to more and more languages, breaking down language barriers in India and countries around the world. As the novelist and physician Khaled Hosseini wrote “if culture was a house, then language was the key to the front door, to all the rooms inside”. We agree—language is incredibly important, not only for understanding culture, but also for accessing information in general. That’s why over the past several months, we’ve been updating our products to work better for the many Indian language users coming online every day. In April, we launched several new features and updates, including neural machine translation for more languages, and just a few weeks ago we enabled voice input for additional eight Indian languages. Today, we’re bringing several updates to the Google Translate app, making it easier for speakers of Bengali, Gujarati, Kannada, Marathi, Tamil, Telugu, and Urdu to translate when they’re on the go. Now, you can do offline translations and instant visual translation in seven more Indian languages, type a Translate query with your voice in eight more languages (the seven above and Malayalam), and use conversation mode in two more languages: Bengali and Tamil. All these features have been available in Hindi, and are now accessible for more languages on both Android and iOS*.